Claim "Illuzion Glass Galleries – Denver"
World famous Illuzion Glass galleries. The best in glass art, pendants and water pipes in Colorado. This shop is so nice all of the 420 tours in town go there. Find smoking accessories, vaporizers, glass pipes all in one beautiful store. You have to see the best glass shop in Denver, Illuzion Glass Gallery. This is one of the best in the country for high end glass pipes to everyday useful art. Now you won’t be disappointed here as there is about 3000 or so pieces to see on display. The hand made glass kaleidoscopes are a must see. Be sure to check out the $1,000,000.00 bong! They have everything you need to dab, smoke, roll all of your fine strains you may buy when in Denver. You can get a replacement banger, nail, custom bowl or some papers here too. They carry an extensive line of pendants, globes, water pipes, oil rigs, grinders and all of your 420 friendly accessories too. 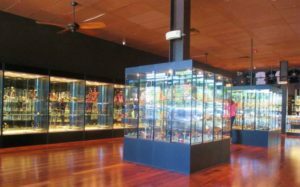 Illuzion Glass Galleries is one of the best glass shops we have seen in decades, due to the quality and quantity of the selections. Stop in and get some butane, or a torch for your new rig. You can also pick up the latest in vapor technology as they carry the best in vapor products from all the best manufactures. They also have a nice line up of dab rigs that will boggle your mind. They have pipes from $5 to $10k for all tastes of people so be sure to pick up your one of a kind masterpiece. The manager and staff are very friendly and always there to hep you out if you have any questions on a piece. They have glass artists on display at various times of the month so we suggest you call ahead if you want to see an artist in action. It is a great sight to behold as they craft a masterpiece. Keep an eye out for the “First Friday Parties” as they are a blast to attend. Stop in and tell them USAWeed.org sent you to claim your 10% discount on your purchase. Toro, SG Sovereignt, Illadelph, MGW, 2010BC/2011BC, Hit Man, Kind Creations, Mobius, MAKA B, MIO, Horny, HVY, WRM, BNG, ADS, Pure, Trident, Sky Glass and more! Cool place, we bought a vape pen. Little pricey here but great pipes. The million dollar bong is wild. Bought a nice hand pipe here, you have to see this place! We loved it. This store is the best I have ever seen. You have to see the ship. OMG but it is a bit pricey.